Hey, where has the famous people game gone? I wanted to respond to myself to get it going again. However, I suggest that we give the last leter of the previous name a try rather than the A - Z variant. There are not too many celebrities whose name begins with a Q (even the indian chiefs would've probably failed me some day). So lets begin. (I forgot to add a short remark before, but I strongly suppose everyone knows who Abraham Lincoln and Nelson Mandela were respectively are). 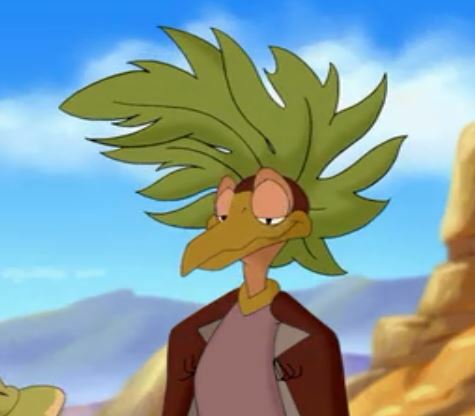 Scott McAfee Known to us as the voice of Littlefoot in the sequels 2-4. Earl Warren - American politician. Republican chief justice of the Supreme Court from 1952 to 1969. He supported the civil rights movement and voted for banning segregation from American schools. However, his name is mostly associated with the so called "Warren report", a report made by a commission lead by Warren about the assassination of JFK that concluded that Lee Harvey Oswald was the "lone nut" assassinator. The "Warren Report" is disputed to this day. Neil Armstrong - The first guy to (supposedly) walk on the moon. Gaius Julius Caesar - roman army leader who triggered a civil war and managed to get so much power that it was the end of the Roman Republic and the empire arouse. He was stabbed by conspirators who feared the results of his ever growing power on the ides of march (March 15th) 44 b.c. Erich Ludendorff - German general in WW1 who lead the last big offensive by the Germans in 1918. After the end of the war he claimed that Germany had not been defeated but that the army had been "stabbed" from behind by revolutionaries. He supported Hitler's party until 1928. It's difficult to find a famous person with an E that does not enforce a very difficult letter such as a Y on the next one. Maybe we shold consider if in some cases the one who posts a name here may allow the next one to use another but the last letter by underlining the first one of the lastname. Lyndon B. Johnson - John F. Kennedy's vize president who succeded him after the assassination. Strongly criticized for letting the war in Vietnam escalate. ^ who is Nathan Lane? Edward Mick Mannock - British WW1 fighter pilot who was blind on one eye and shot down 73 planes before he was killed by groundfire himself. Napoleon Bonaparte - The only famous person that comes to my mind who is better known by his first than by his last name. French general who later made himself first counsule and finally emperor of France. He lead many wars against almost every other European country and conquered huge regions. Than again he did spread a very modern and enlighted law code in the regions he occupied. In 1813 he was military defeated and forced to go into exile. He returned though in 1815 but met his Waterloo, well at Waterloo. After that he was brought to the island St. Helena where he died in 1821. ^ I guess you did see him. He was Frodo in the lord of the rings, and for all I know you did see at least one (maybe more, dunno) of the lord of the rings movies. Dietrich von Bern - hero from a medieval saga. Knight who probably had a historical model in the Goth king Theoderich. Nelly - I think he's a pretty famous rapper in this country...I don't listen to that genre but I had to put down something for n.
I suggest that in case we come up with a name ending with a Y the one who posts it may underline a letter different from the last one. The world is not exactly swarming with people whose first name begins with a Y, and after we've had Yuri Gagarin and some Japanese and Chinese emperors I'm afraid the lack of Y might cause a repetition. On the other hand the many names that end with a Y should not be banned (I've avoided Elvis Presley before in order to spare you a Y). Another suggestion is that in case of the Y it is okay if a persons last name begins with a Y as well (there are more last than first names with this letter). How many people in the US have your name?